Yes, you can actually visit The Grenadines and NOT PAY an arm and leg for accommodations! 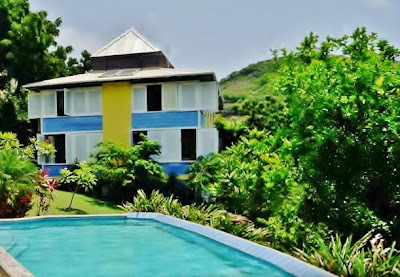 When I visit Bequia each year, this is where I choose to stay - that's my room on the bottom floor to the left with king-size four-poster bed, mosquito netting, flat screen TV, nice Caribbean style furnishings, separate large kitchen and dining area with shutters that can be opened to provide wonderful views. 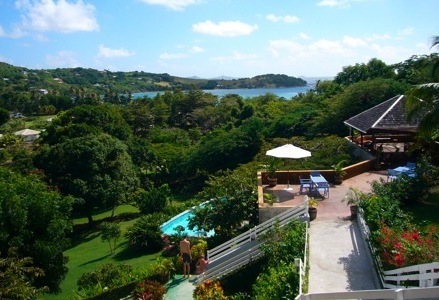 The Sugarapple Inn is a small, private hideaway on the island of Bequia. The inn is just steps away from the white sands of Friendship Bay Beach, where the warm Caribbean Sea is calm as glass, making for fantastic swimming or snorkeling. The manager takes an active role in ensuring each guest has the best possible vacation. For starters you can request the refrigerator be stocked, and all guests are picked up at the airport. Guests are also given a local phone with pre-programmed numbers to reach management any time of the day or night. Additional phone numbers are included for local restaurants, taxi's and other island services. Must try restaurants: Fernando's Hideaway, Tante Pearls, Da Reef at Lower Bay, Jack's Bar at Princess Margaret Beach, Frangiapanni Hotel's Saturday breakfast buffet, The restaurant at the Gingerbread, Blue Tropic at the Bagatelle Resort, and The Moskito Bar/Grill about 200 yards stroll up the beach.